Congratulations to Peter Gelencser, Event No. 7 Champion ($180,730)! The largest 2-7 Triple Draw Lowball tournament is all over and done with and Peter Gelencser is your champion! 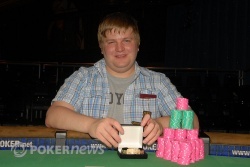 It may not be the largest monetary score of his young poker career, but it is the most memorable for Gelencser as he's walking away with a brand new piece of jewelry and one that every poker player covets dearly. The Hungarian is also only the second player ever from his home country to capture a bracelet. The quest began back on Tuesday when 291 entrants ponied up the $2,500 buy-in to take to the felt in Event No. 7: 2-7 Triple Draw Lowball. After Day 1, about a third of the field remained, After Day 2, only eight players remained. Gelencser was one of those eight remaining players and came into the final day of play second in chips behind top professional David Chiu, who was definitely the favorite coming into Day 3. Chiu's stay at the top of the pack didn't last too long as he relinquished the chip lead within the first level of play on the final day. All of the momentum Chiu was able to gather on Day 2 seemed to fall by the wayside as he never really got about the amount that he started with. Even despite not being able to build his stack much, Chiu kept himself in solid contention the entire way and wound up battling to a fourth-place finish. Once Chiu was gone, Don McNamara was next to be clipped from the final table. McNamara butted heads with Raphael Zimmerman numerous times, who is rumored to be the best online deuce-seven player in the world. Most of those confrontations went to Zimmerman and then it was Gelencser who delivered the final blow, leaving himself heads up with Zimmerman. Gelencser definitely flew under the radar for most of the event and it wasn't until late on Day 2 that he began emerging as a threat to the rest of the field with his very solid play. Somewhat methodical at times, Gelencser made the correct plays when he needed to. Once Gelencser got on a roll at the final table, he was able to steadily build his stack and maneuver his way through a tough field of competitors before making it heads up with deuce-to-seven specialist Zimmerman. Heads-up play only lasted a handful of hands before Gelencser finally finished off his adversary. Taking home the title earned Gelencser $180,730 and his first World Series of Poker gold bracelet! Congratulations to him for conquering Event No. 7. Here's how the entire final table wrapped up. As for us, that wraps up another batch of coverage from the 2010 WSOP. Be sure to browse around and check out all the other events we're live on the floor for here at PokerNews. We hope you enjoyed it as much as we did! It only took two hands after break for things to end for Raphael Zimmerman. He lost a good chunk of his chips on the first hand back and then on the second hand, was all in after the second draw. Peter Gelencser made the call and stood pat. "What do I have to beat?" asked Zimmerman. "I've got nine-seven," responded Gelencser, standing and putting down the . "Oh, I can beat that," said Zimmerman as he tossed once card away and drew to an . Unfortunately for Zimmerman, he drew another and it paired his hand. 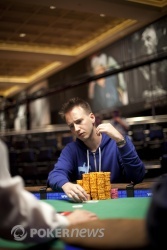 Zimmerman was eliminated in second place and earned $111,686 for his effort. Here are the chips counts on the break. We're now on a break. The TD is coloring up some chips and introducing the teal (T25,000) chips. There were two bets from each player. Raphael Zimmerman drew three and Peter Gelencser drew two. Zimmerman check-raised a bet from Gelencser and Gelencser called. Zimmerman drew one and Gelencser drew two. Zimmerman bet and Gelencser called. Zimmerman stood pat and Gelencser drew one. Zimmerman bet and Gelencser raised. Zimmerman mucked his cards and Gelencser took the pot. Both players put in three bets before the draw. "We're going to see a hand," said the tournament announcer. Raphael Zimmerman was first up and drew two. Peter Gelencser followed suit and also drew two. After the draw, Zimmerman bet, Gelencser raised and Zimmerman called. Following the action on that street, Zimmerman drew one and Gelencser stood pat. Zimmerman then check-called a bet from Gelencser. Zimmerman then drew one and Gelencser stood pat again. Zimmerman checked, but this time he folded when Gelencser bet and the Hungarian scooped the pot.